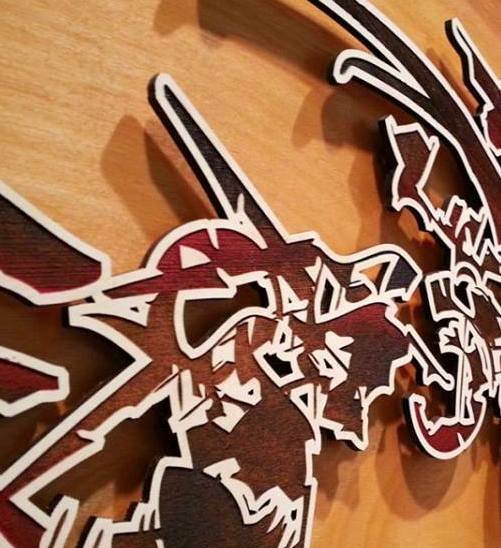 Building Momentum; PI&S Summer 2014 Resident Artist Christopher Breedlove. We’re excited to feature “Momentum,” a new body of work by Christopher Breedlove opening Friday, August 1st (A WPB “Orange Dot ” First Friday) from 6pm to 10pm. Much of it was created during his summer residency at Pen, Ink & Song. It’s been a busy few years for Mr. Breedlove, and he shows no signs of stopping. Two years ago he travelled to Taiwan, where he created the Taixi Wind Temple sculpture at the TaiXi International Arts Festival. Last year he produced a group of amazing pieces called “Digital Seed” during a residency at IFL (Idea Fabrication Labs) in Chico, California. He has continued to evolve and expand his Human Avatar Project, a massive interactive projection installation that has become a fixture at the Electric Forest Festival in Rothbury, Michigan. Just this Summer, his work has already been featured in two group shows, “Zen Station: Desert Dreams” (curated by Marci Rubin) and “Emergence,” a Mako James opening at Chicago Art Department. He’s building momentum, and its a pleasure to see him at work in the studio, putting the finishing touches on what will no doubt be one of the most exciting First Fridays of the year. Don’t miss it, and make sure to visit the other open studios in this historic artists’ colony. As usual there will be refreshments and live music throughout the building. Come get lost in the Flatiron! Eric B. Rivera is a Chicago-based artist who grew up in northwest Indiana. After earning his BA in Studio Art and Film Studies from Indiana University, he spent time living and working in Brooklyn, NY and Northampton, England. His work has been featured in Alan Moore’s Dodgem Logic, The Logan Square Literary Review, Lumpen, Chromazoid, & VICE, and he has exhibited artwork in Chicago & overseas. He is also active within Chicago comix artist outlets Brain Frame &Trubble Club, as well as frequent contributor to jungle-haze band, Energy Gown. 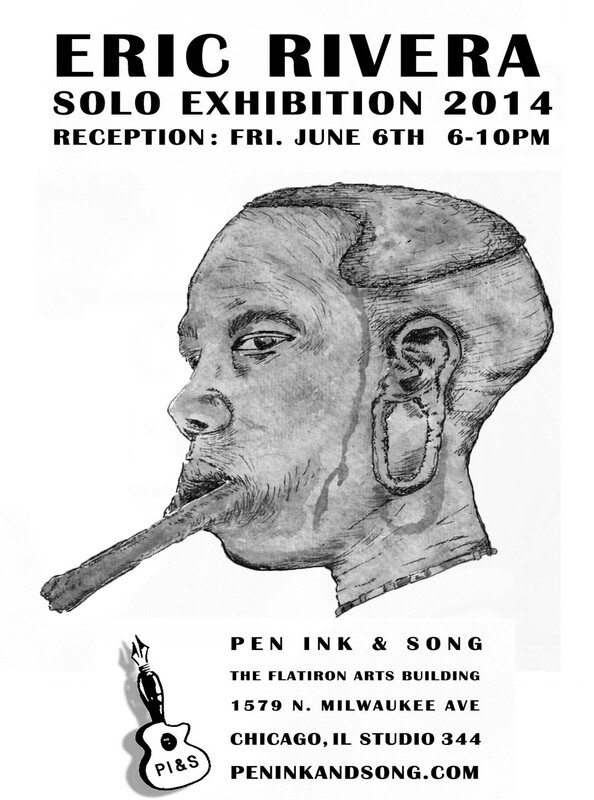 Burkhart Artist Talk makes for a somber yet inspiring evening at Pen, Ink & Song. 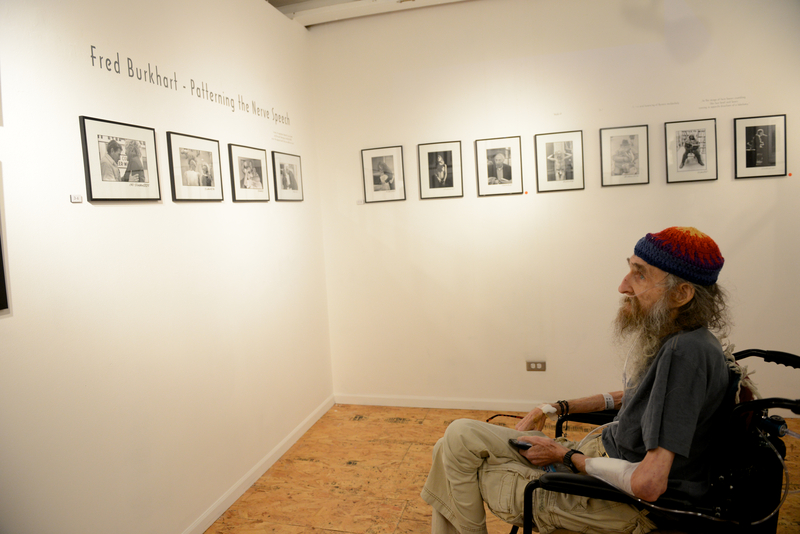 Fred read the first section of the poem from his wheelchair, surrounded by his photographs. It was a brief reminder of the underground coffeehouses he used to curate, microphone in hand, holding court, cracking jokes, reading Whitman, introducing the next musical act, or simply getting a group of people in a room to pay attention to the moment at hand. 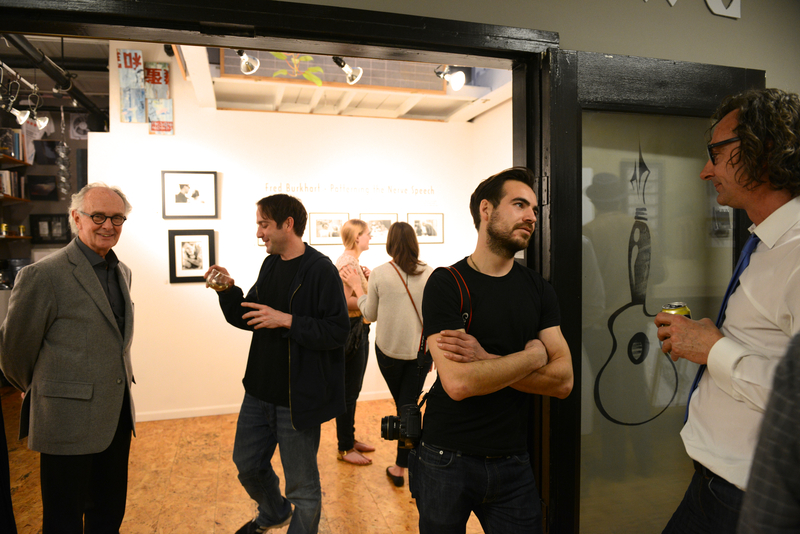 (left to right) Gallerist Carl Hammer, painter Kevin Fair, photographer Edouard Pierre, and gallerist Ken Saunders. Photos courtesy of Natalie Miller at NGM pix.